Hollis JohnsonOur McLaren 570S Spider test car. The McLaren 570S Spider walks a fine line between English sports car and a no-holds-barred exotic supercar. The 570S is powered by a 562 horsepower, 3.8-litre, twin-turbocharged V8. It can do 0-60 mph in 3.2 seconds and reach a top speed of 204 mph. In the marketplace, the 570S Spider competes against the Audi R8 V10 Spyder and the Porsche 911 Turbo S Cabriolet. 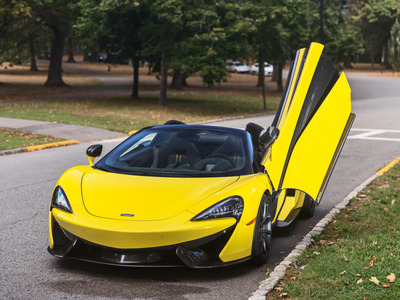 The McLaren 570S Spider is a supercar. Sort of. 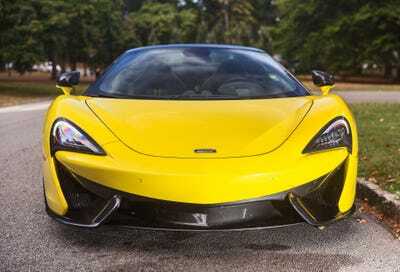 The 570S is a mainstay of McLaren’s entry-level Sports Series, and the company openly calls the stylish mid-engined speed machine a sports car. 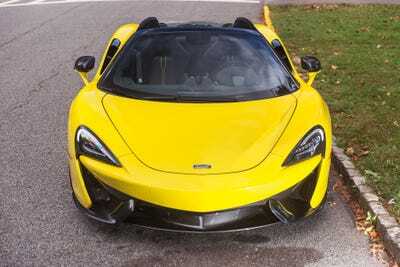 But step on the gas, and the 570S will quickly convince you of its European supercar credentials complete with supercar power, speed, and charisma. As a business proposition, the Sports Series has been phenomenally successful. 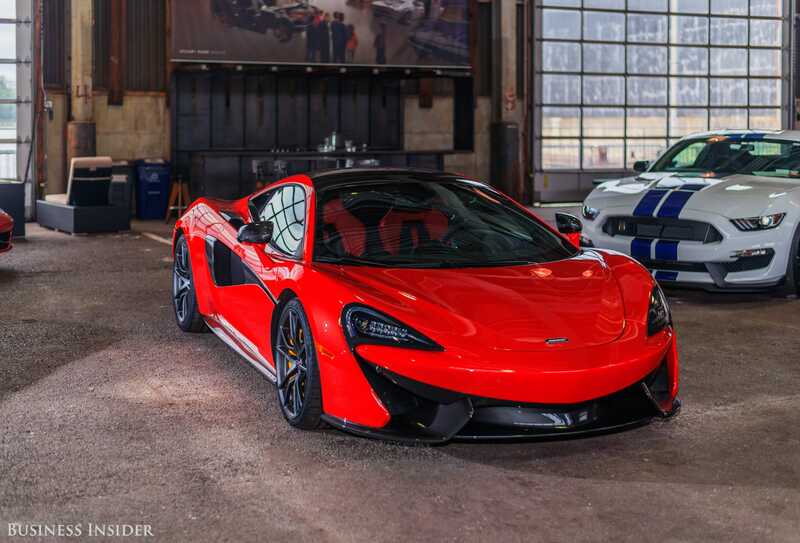 The 570S and its Sports Series siblings also comprise the lion’s share of McLaren’s annual sales. In 2017, McLaren sold a total of 3,340 cars worldwide of which 2,119 were various versions of the Sports Series. 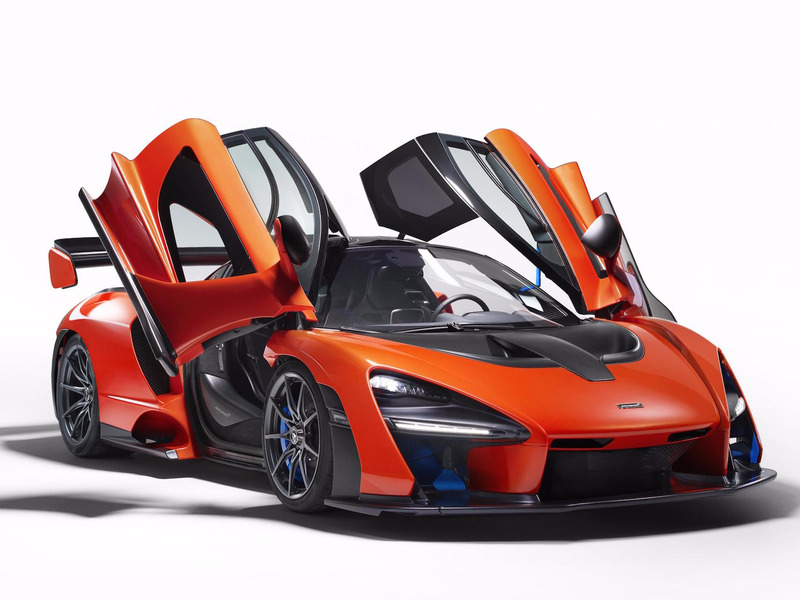 According to the Woking, England-based company, the lower entry price of the Sports Series has successfully attracted a new wave of customers to the brand most famous for its multi-million dollar F1 hypercar of the 90s. 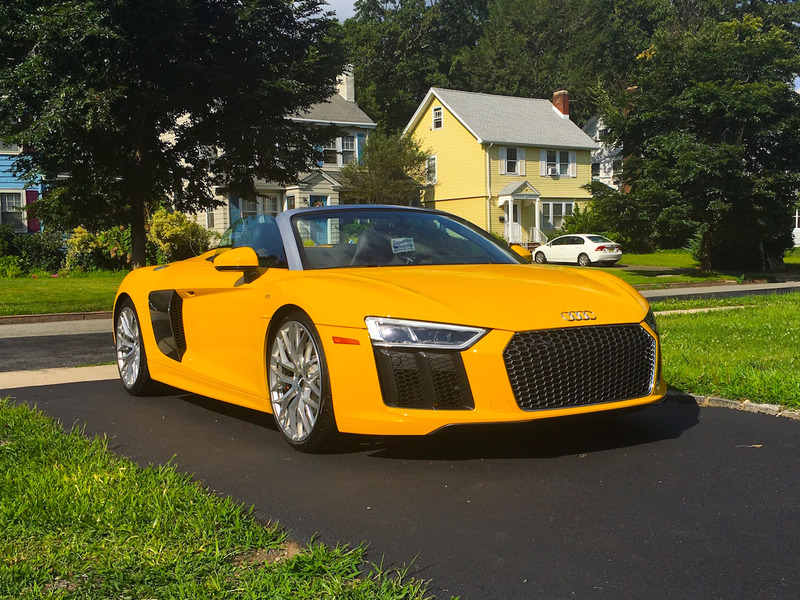 In 2016, Business Insider had the chance to spend a few days behind the wheel of several hard-top Sports Series models and came away impressed by their handling, performance, and eye-catching good looks. 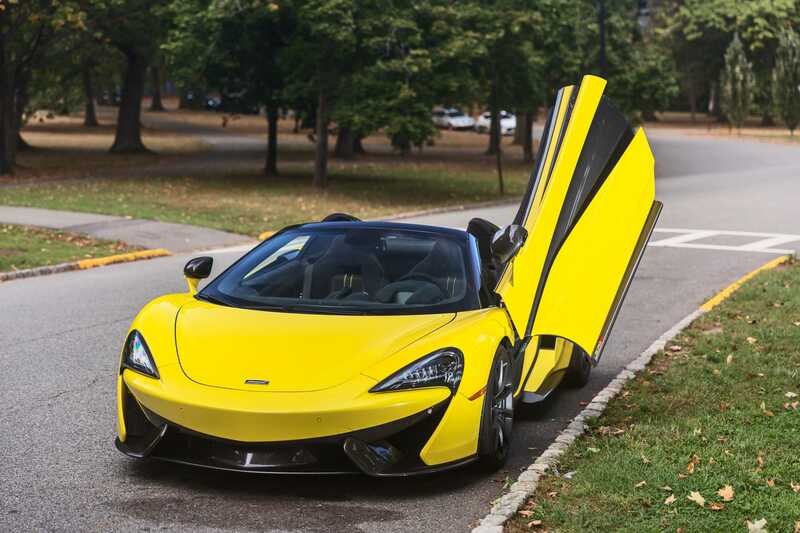 Last fall, we spent a week with a brand-new McLaren 570S Spider in an eye-catching Sicilian Yellow paint job. 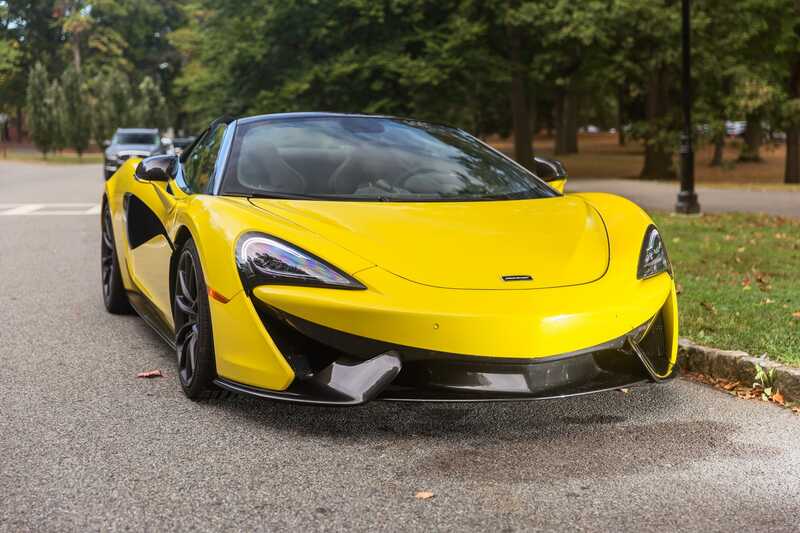 The 570S Spider starts at $US208,800, but our test car came packed with nearly $US44,000 in options. 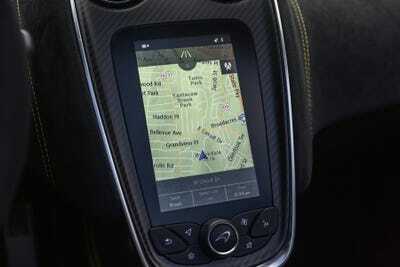 That gave it an as-tested price of around $US253,000. Here it is. 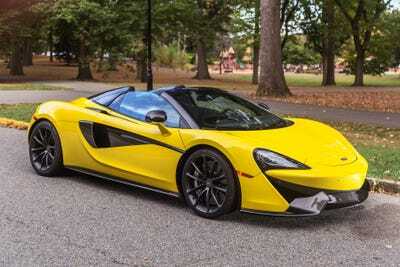 The new McLaren 570S Spider. It’s the convertible counterpart to the 570S Coupe we tested in 2016. … The McLaren Senna hypercar. …. 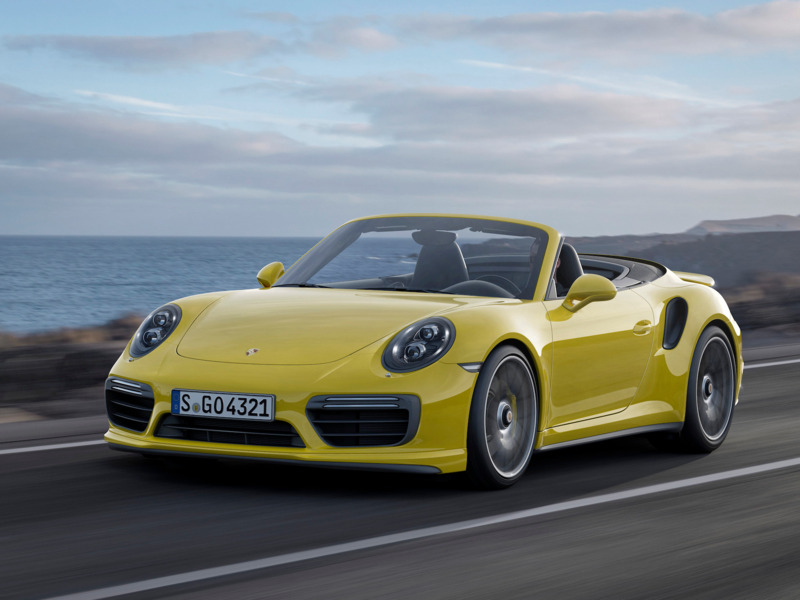 The Porsche 911 Turbo S Cabriolet. Both are from VW Group. Aesthetically, the 570S’s striking lines are the work of McLaren design boss Rob Melville. And in true McLaren fashion, the 570S is designed for aerodynamic efficiency as much as it’s designed to look beautiful. These LED headlight look pretty darn amazing. In a 2015 interview with Business Insider, Melville explained that the 570S’s carbon fibre structure was designed to be practical with great driver visibility and easy ingress and egress in mind. For all of its practicality, storage is pretty much limited to the trunk. But if the top is up, you can store items under the tonneau cover. Then again, how much stuff do you really need to haul in your McLaren? The 570S Spider is feather-light. 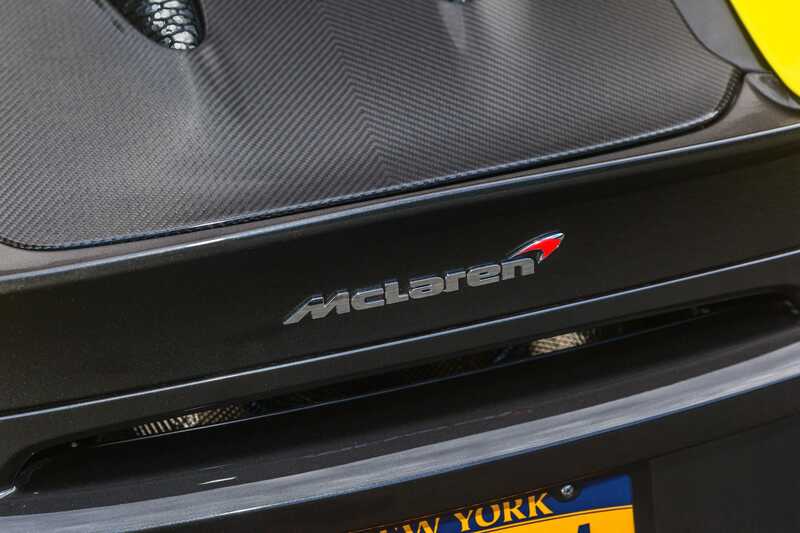 Even when weighed down with a tank of gas, the McLaren tips the scales at 3,276 pounds. The Spider is 75 pounds heavier than the Coupe due to its electric-operated folding hard top. It’s also tiny. At 178.3 inches long, the car is shorter than a Toyota Prius. 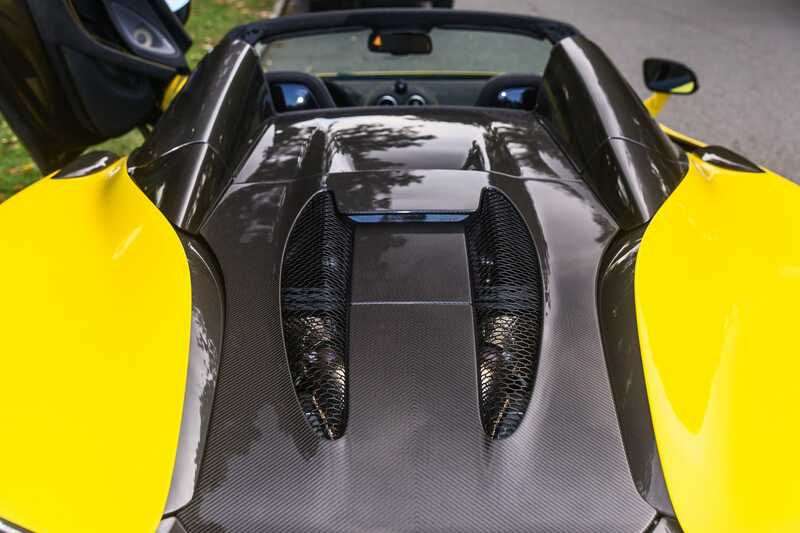 Here’s the McLaren 570S Spider’s performance dossier. Lurking underneath a carbon fibre cover is a 562-horsepower version of McLaren’s tried and true M838T 3.8-litre, twin-turbocharged V8. 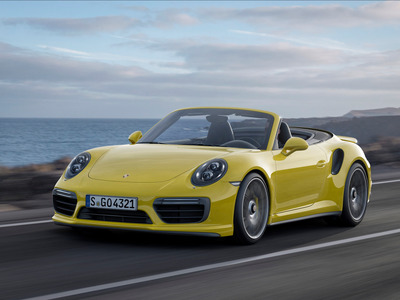 The high-revving V8 drives the rear wheels through a seven-speed twin-clutch gearbox. 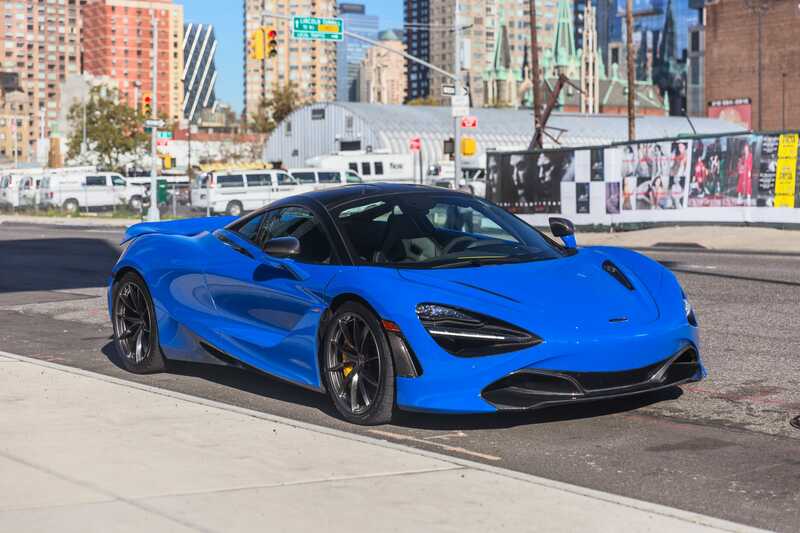 According to McLaren, the 570S Spider can hit 60 mph in just 3.2 seconds and run the quarter mile in 11.0 seconds before reaching a top speed of 204 mph. However, McLaren has been known to sandbag its official performance figures to protect older models like the 650S. For instance, McLaren claimed the 570S Coupe could do 60 mph in 3.1 seconds. However, car magazines have been able to make the same run just 2.7 seconds. Which means the Spider will probably do 60mph in less than 3 seconds. Performance stat source: Car and Driver. 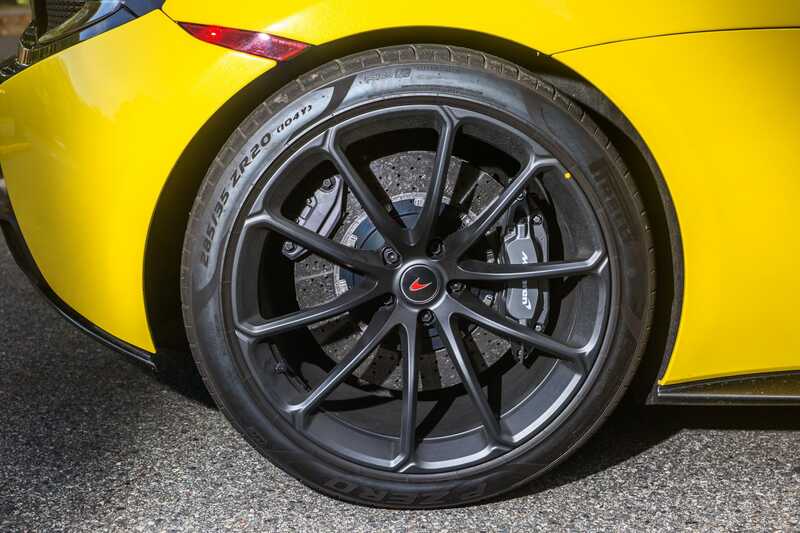 The stopping power comes courtesy of a massive set of carbon ceramic brakes. 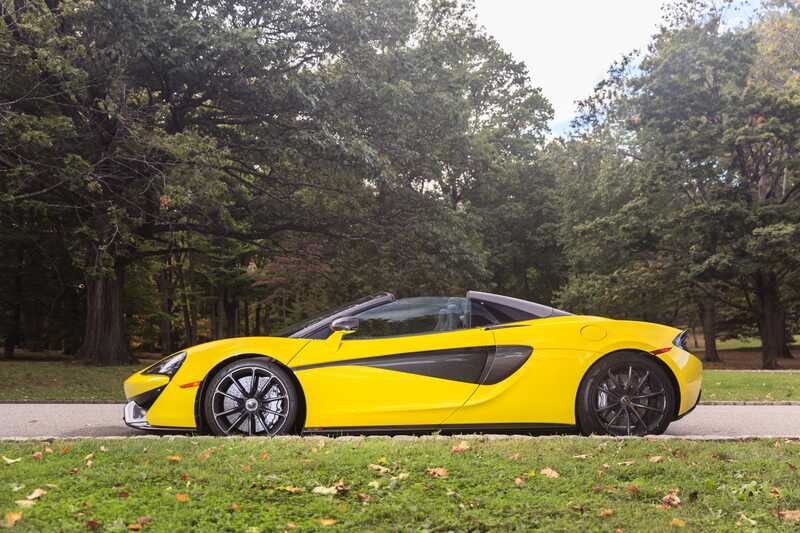 The 570S Spider takes just 105 feet to stop from 62 mph. 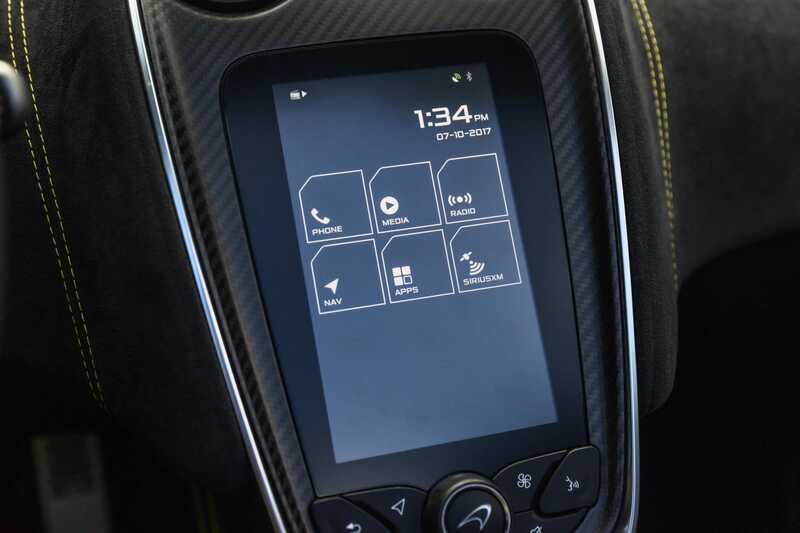 Inside, the Spider’s cabin is what you would expect from a car built by a company that’s won 182 times in Formula One. It’s high tech and all business. 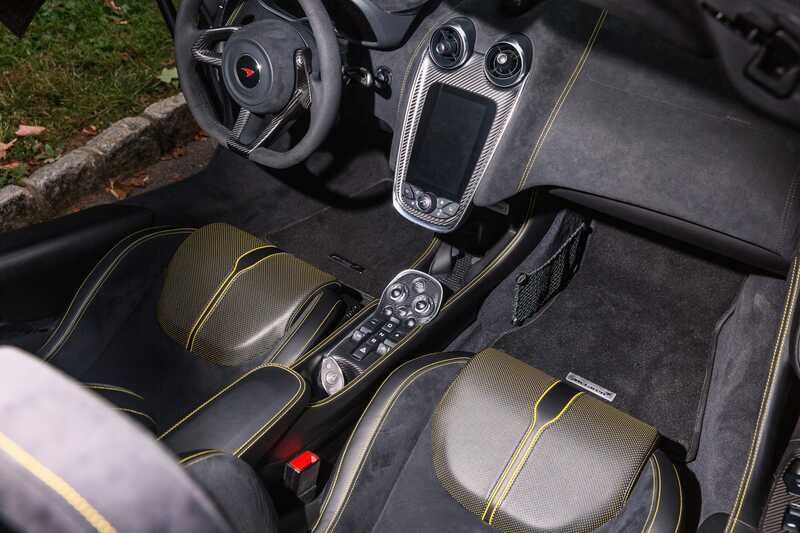 The 570S cabin is dominated by swaths of leather, Alcantara, and carbon fibre accents. The design is simple, uncluttered, and easy to learn. 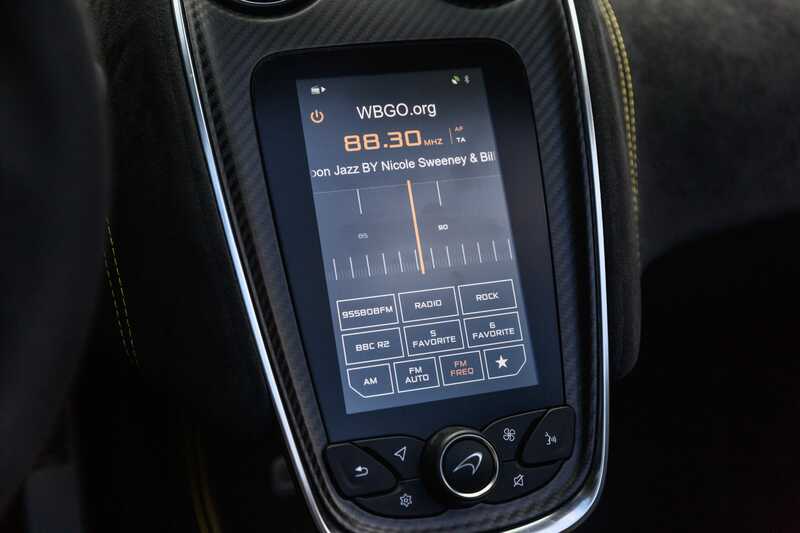 In front of the driver is a configurable 10-inch digital instrument cluster. 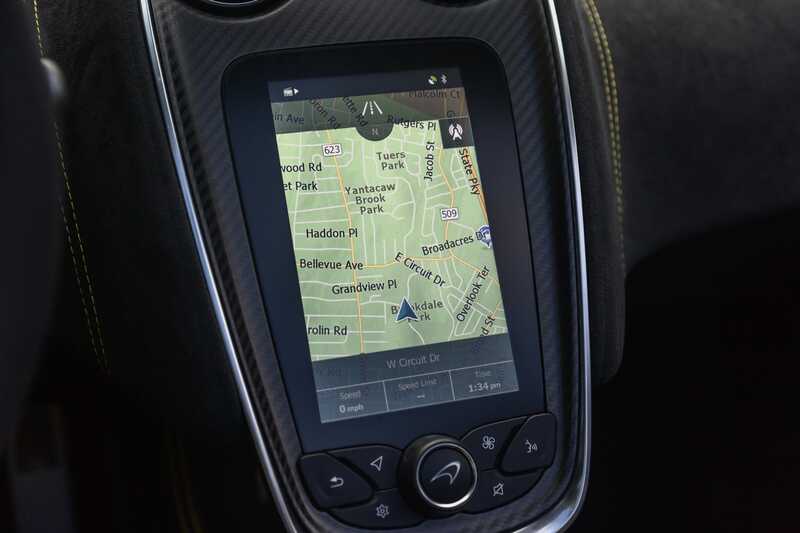 The center stack is equipped with a vertically-oriented seven-inch touchscreen. 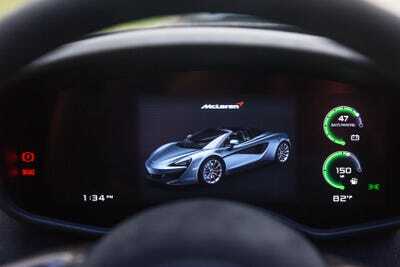 It’s powered by an older version of McLaren’s IRIS infotainment system. The menu layout is incredibly confusing. 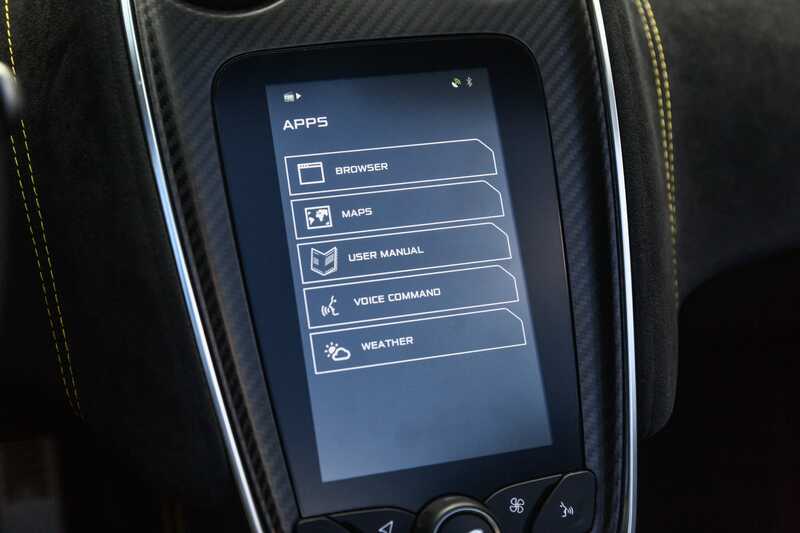 It’s unintuitive and fairly difficult to use, specially in a car that commands so much of the driver’s attention. On a positive note, the graphics look pretty good. The center console is where you’ll find the drive mode selectors and push-button transmission controls. It’s also where you’ll find the cup holders. They don’t work that well. Finish your coffee before you drive. The McLaren 570S Spider is top-down motoring at its zenith. The powerful V8 revs freely and delivers plenty of power, while its sports exhaust barks with joy. 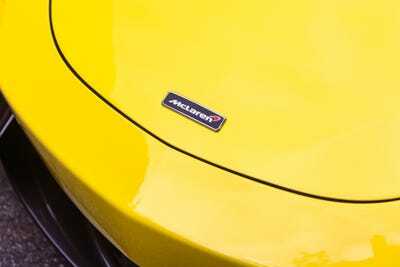 The McLaren’s performance credentials and price tag puts it squarely in the entry-level supercar segment along with the likes of the Audi R8 and Acura NSX. But the driving experience is decidedly different. Unlike most supercars I’ve driven, the 570S feels light and tossable. 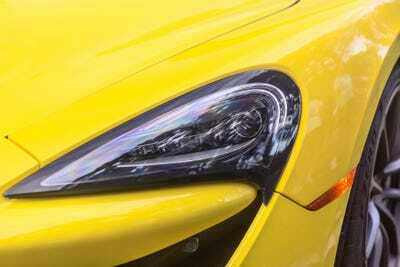 The driving dynamics resemble that of a four-cylinder Lotus more than its big brother 720S. In fact, if Lotus were to build a modern, carbon fibre follow-up to the Esprit supercar, I’d imagine it would look and feel a lot like the 570S. But there were flaws as well. Generally speaking, no supercar in the world rides as smoothly as a McLaren. However, the 570S Coupe and Spider are missing the company’s trick hydraulic suspension found on pricier models like the 720S. As a result, the 570S rides a bit harsh. Something made evident on New Jersey’s bumpy roads. In addition, the 570S Spider lacks brake pedal feel. While its carbon fibre brakes could stop a heard of stampeding elephants, its pedal feels stiff and difficult to modulate precisely. In my review of the 570S Coupe, which I drove two years ago, I begrudgingly agreed with McLaren that this thing is a sports car. I’m not so sure anymore. Instead, I feel like the 570S, along with the Porsche 911 Turbo S, straddle the line between sports car and supercar. Both have the straight line speed to hang with or even embarrass the top echelon of European exotics while delivering a driving experience akin to a nimble sports car. For that reason, the McLaren’s attributes are incredibly rare in the marketplace. As for value, the 570S Spider isn’t cheap. It’s starting price is more than $US25,000 more than the Audi R8 V10 Spyder and it isn’t really any faster than the comparably priced Porsche 911 Turbo S Cabriolet. 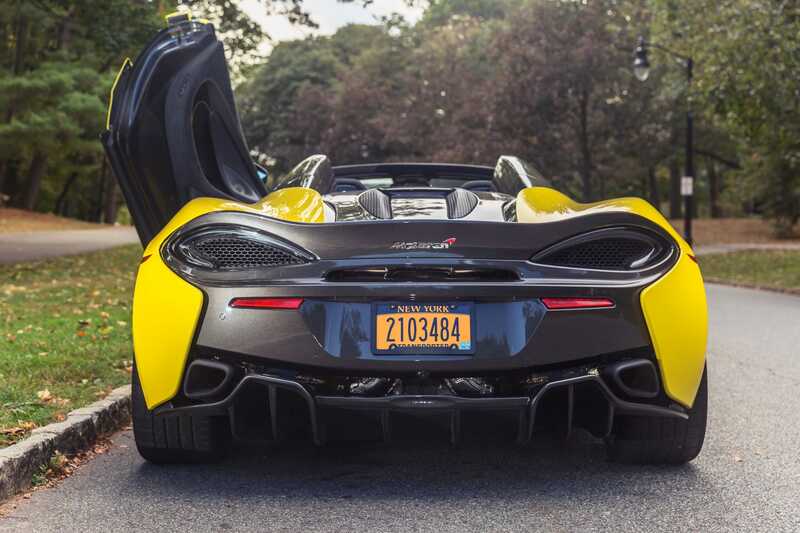 However, neither car has the 570S Spider’s high-dollar carbon-fibre construction. Which brings us back to the original question. 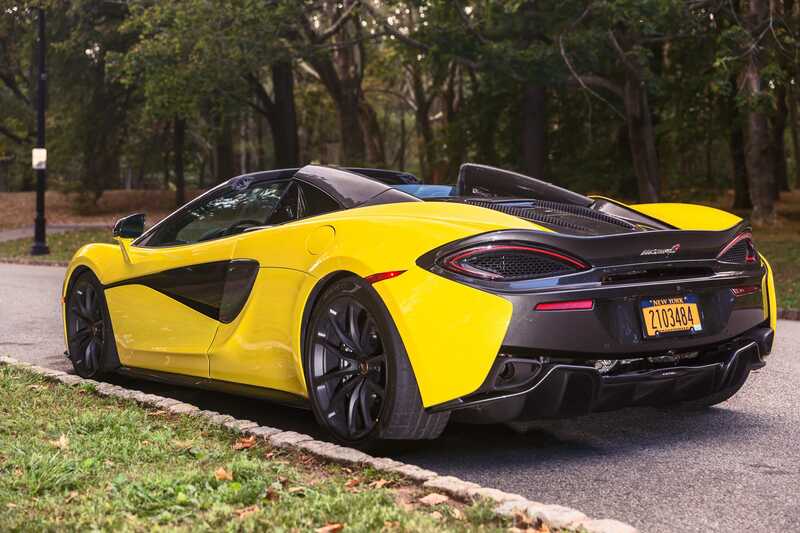 Is the McLaren 570S Spider worth its hefty price tag? Yes. It’s not better or worse than its rivals. It’s just different in construction and feel. I’ve said it before and I’ll say it again. McLaren has something special on its hands. If you have the money, it would be a mistake to not at least take a look.